Time to check in with a couple of my favorite mildly eccentric up-and- coming recording artists. Cute-as-a-doll Janelle Monáe is featured on a new track by the pop duo Chester French. To hear “Nerd Girl” on my Vox blog, click here. Janelle does more than hit the notes; she pumps the whole thing up with her personality. You can cop “Nerd Girl” for FREE, as part of a full-length Chester French mixtape called “Jacques Jams”... if you’re willing to provide your name and email address to the Chester French website. FYI: Ms. Monáe will be gigging tonight through Friday in Brooklyn. Moving on to Black Kids, the Florida alt-pop band that took England by storm last year. They have a new EP out called “Cemetery Lips.” It contains remixes of previous singles plus B-sides. Click here to hear “You Only Call Me When You’re Crying.” Not as tasty as the cuts I wrote about last year, but still. 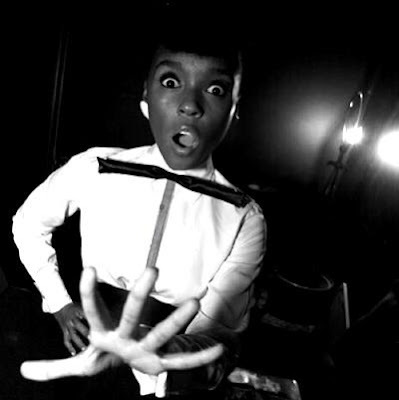 Janelle does more than hit the notes; she pumps the whole thing up with her personality.Word. Maybe it's not fair to make this comparison, but that's what I found lacking in Santigold's performance when she was on Jimmy Fallon's show. Anyway, looks like Janelle's show is sold out; and thanks for the stream. Nice. BTW, UBM...Thank you, Thank you, Thank you for putting me up on Ruth Copeland. Just copped the vinyl from Ebay. Best rare funk purchase I have made since "Games, Dames and Guitar Thangs"! ^ Very cool, DRE. Ruth Copeland's "I Am What I Am" was the best rare funk purchase I ever made.